It is the first Wednesday of the month, and that means it is time for MFT‘s new releases. 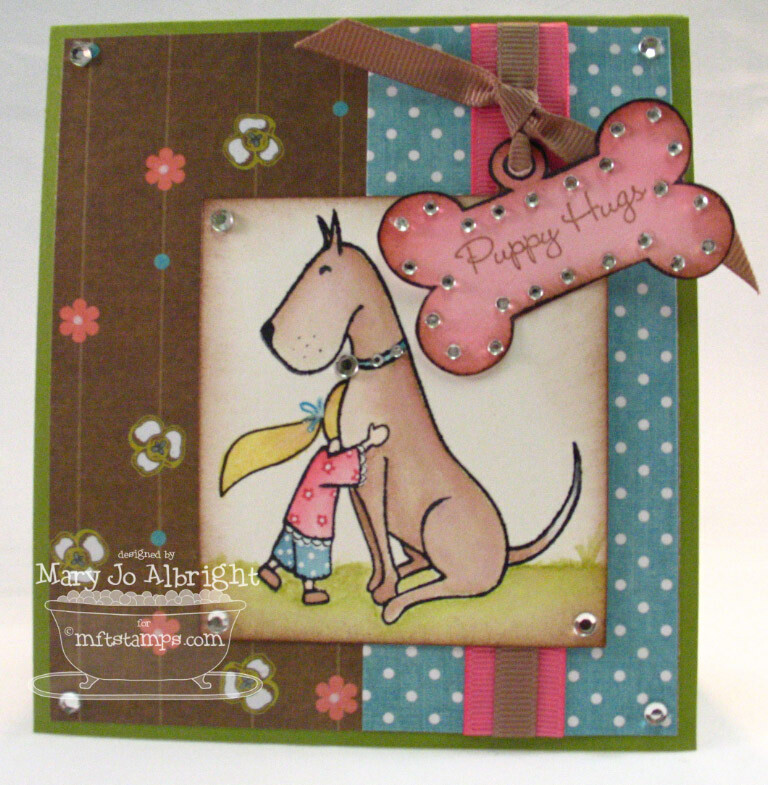 This month, there are 3 sets: Friends Furever Mini set, and 2 full size sets called Goin’ Places & Gone to the Dogs. I also used Setting the Stage set in some of my samples because of a promo running till June 1st. 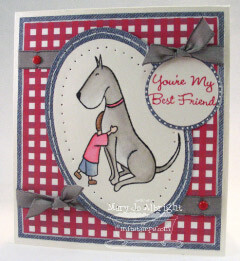 Let’s start with one of my favorites…Friends Furever. I have a large dog & a little boy so I instantly fell in love with this set. I also want to show you that it can be made for a little girl as well. Gotta love how sweet the image is. I added the pony-tail by using one of the leaf images from MFT’s stamp set Build a Bouquet. The next sample is from Goin’ Places new release & Setting the Stage Promo set. 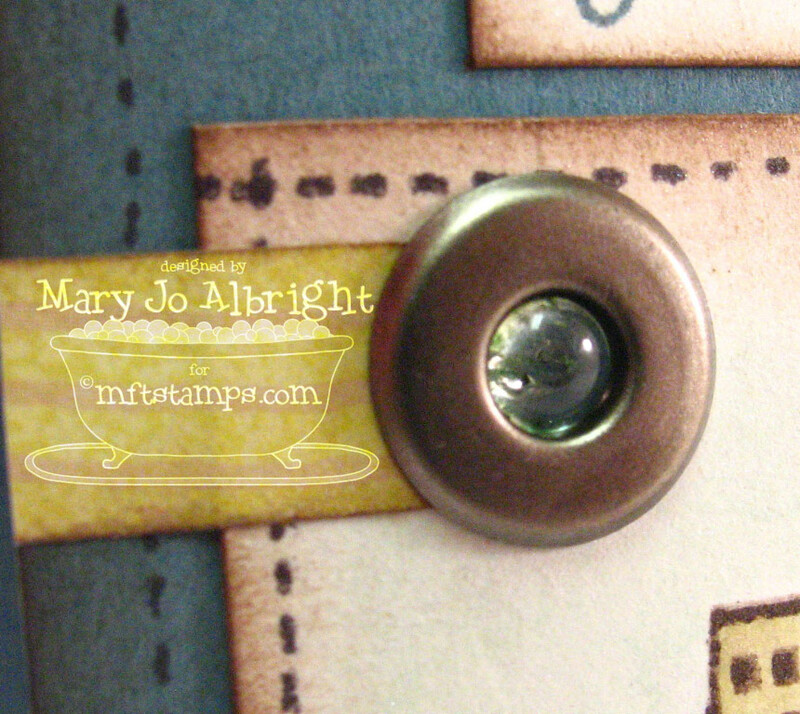 I discovered (well, someone may have already did this, but it is a new “wow” embellishment for me) that a Dew Drop fits snuggly into a large eyelet. I love that you made it with a little girl too. Love that set, it’s adorable! Also the dew drop/eyelet idea is genius! Mary Jo you always WOW me! I just love your “girl” version…I don’t have any boys, but I have 2 girls who are always begging me for a puppy. And the dew drop in the jumbo eyelet…another WOW! Love them all…TFS! These are all super cute! I miss having a dog in the house, and am trying to talk DH into another one! Maybe I will leave him various “dog” cards around the house with these sets to try to plead my case! LOL! 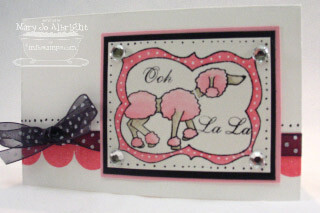 Your cards are beautiful Mary jo and your coloring is gorgeous. LOVE the fun designs and detail.